Go at it and let off some steam with your arch nemesis or your best pal. 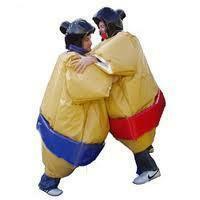 Jumbo sumo wrestling comes with 2 suits, helmets, and a mat. Requires 4 extra people to keep wrestlers in ring and help lift them up when they fall.